What does OHLA do? 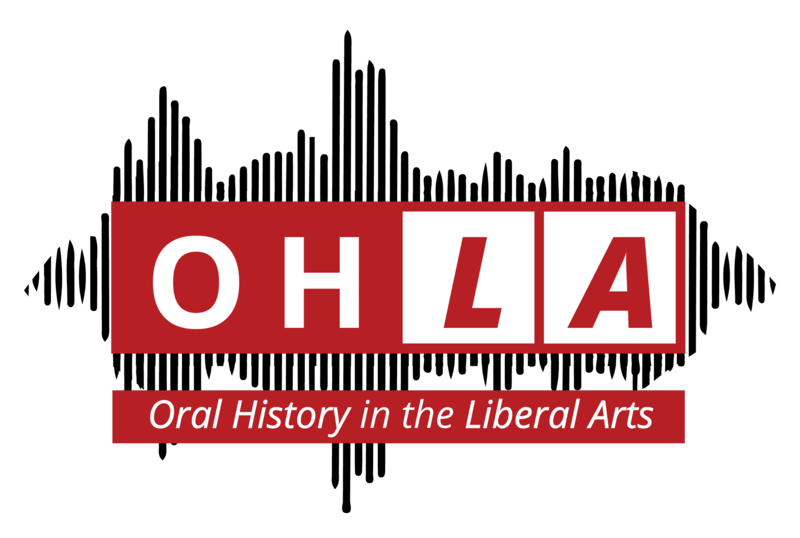 OHLA is a collective guided by a core group of GLCA-affiliated pedagogues who provide direct support to faculty and students engaging in community-based learning and innovative undergraduate research. OHLA participants undertake their projects using best-practice interview methods and a curated set of digital tools, building public-facing projects and sharing pedagogical strategies, reflections, and tutorials in the online resource hub. OHLA supports more than 35 projects across the GLCA. Through Global Challenge projects, connected courses, and direct micro-grants and stipends, OHLA hopes to develop and support international projects across the Global Liberal Arts Alliance in 2019 and forward. Why Oral History? OHLA treats oral history as a research methodology that can be easily harnessed in undergraduate fieldwork. 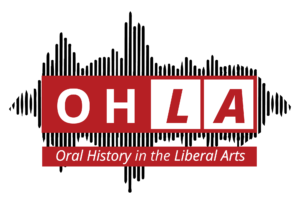 OHLA participants are not oral historians per se, they are literature professors or environmental scientists looking to engage students in highly experiential ways of exploring the themes in their courses. With the encompassing ethical notion of “informed consent“ and basic best practices, this form of interviewing can be quickly learned and employed to provide structure for student inquiry outside of the classroom— while generating primary source material with diverse communities to bring back into the classroom. Why Digital Scholarship & Digital Storytelling? Research suggests that students more fully engage in their learning when they have a meaningful audience for their work, when their findings have an impact beyond their course, and when they are active participants in designing the learning process and its outcomes. Tools for digital scholarship such as the Oral History Metadata Synchronizer provide a platform for close listening and controlled exposition that synthesizes and thematizes interview segments. Digital storytelling tools such as Storymaps or Timeline support multimedia assemblages featuring narrative, place data, and imagery. When the multimedia work developed in these tools is published as a capstone digital project, faculty-mentored student research realizes multiple audiences, completing a “high impact” loop of participatory inquiry and meaningful assignments that animate course-level and program-level learning outcomes. These faculty-driven projects are developed to build experiential, community-based learning into existing curricula, often over consecutive offerings of a course. In some cases, they are lead by campus centers with a course or co-curricular connection. E. Yochim, Allegheny College, Meadville Youth Media Project. 2016. R. Martin, Denison University, Literature and Professional Life Archive. 2016. N. Sugimori, Kalamazoo College, War Memories Intergenerational-Intercultural Project. 2016-17. E. Cole, Hope College, Sierra Leone Amputees Oral History Project 2016-17. B. Mills, Kalamazoo College, Engaging the Wisdom Civil Rights Oral History Project. 2016-17. I.MacMillen, Oberlin College. A Storied People: Placing Cleveland’s Roma-Gypsy Community on the Oral History Map. 2017. J. Schroeder, Earlham College. Oral Histories of Place and Identity in Richmond, Indiana. 2017. A. Carr, Allegheny College. Using Oral History to Make Public History in HIST 190. 2017. G. Perez and A. Bautista, Oberlin College. Latina/o/x Oral Histories of Northeast Ohio. 2017. A Krone, Allegheny College. The Jewish Meadville Project. 2018. B. Miller, Allegheny College. HIST 358 – Migrants & Refugees in the 20th Century. 2018. R. Kraince, Antioch College. Incorporating Oral History Methodology into Participatory Action Research Abroad. 2018. T. Boster, Oberlin College. Oberlin History: Community-Based Learning & Research Practicum. 2018. These student-driven projects are designed to support full-time student research under the guidance of an individual faculty mentor, often in advance of their senior project. Students articulate their project statement and questions, conduct interviews to create primary-source material, and curate and utilize that material in some form in a public-facing project. In some cases, students do the fieldwork over the summer, in other cases they are within a formal practicum course within a block or other term. M. Fuji and Prof. E. Steinmetz. Antioch College. Greening a City: Stories of Environmental Work and Activism in Buenos Aires. (bilingual) 2017. E. Burke, and Prof. C. Fairbanks, Antioch College. Sweetwater: Fishing in the Great Lakes Region. 2017. A. Urbano, and Prof. R. Sheffield, Kenyon College. Claiming Our Place: In Search of the Latinx Presence on ‘The Hill.’ 2017.• A. Ngyuen and Prof. N. Bingham, Earlham College. Negotiating Values and Relations. 2017. A. Clothier and Prof. S. Pack. Custodians of the Past and Guardians of the Future: Digital Storytelling in the Yucatan Peninsula. 2018. D. Gracia and Prof. J. Montano, Hope College. My Story Can Build Our Bridge: Latinx Experiences at Hope College. 2018. M. Harris-Ridker and Prof. C. Craven. Queer Voices & Feminist Histories: The Development of Women’s, Gender, Sexuality, and Queer Studies Programs. 2018. A. Hirmke and director L Knight. International Stories: Student journeys to, during, and after Earlham. 2018. M. Myers and Prof. E. Yochim, Allegheny College. An Ethnographic Exploration of Rural Queer Community Organizing. 2018. H. Samake and Prof. R. Kraince, Antioch College. Migration Justice: Transnational Advocacy in an Era of Populist Nationalism. 2018. A. Force and Prof D. Johnston, Hope College with Dagmar Kusa, Professor of Political Science, Bratislava International School of Liberal Arts, Slovakia. Gen-narratives: A cross-generational exploration of apartheid and post-apartheid oral histories. 2018. C. Bernhardt and Prof R. Nemeth with Prof. Raheem Haq, Forman Christian College, Pakistan. Gen-narratives: A cross-generational exploration of apartheid and post-apartheid oral histories. 2018. K. Zechar, Antioch College, in WORK 425: Oral History & Digital Scholarship. The Turkish Community in Dayton, Ohio. 2015.• E.
E. Rhodes, Antioch College, in WORK 425: Oral History & Digital Scholarship. The Coloring of The Gem City: Redlining and the Legacy of Discriminatory Housing in Dayton, Ohio 1936-Present. 2015. C. Pulitzer, Antioch College, in WORK 425: Oral History & Digital Scholarship. Stages of Staying, Stages of Leaving, Stages of…….. (bilingual) 2015. E. Bell, Antioch College, in WORK 425: Oral History & Digital Scholarship. Visualizing the Presence of Loss. 2015. D. Kondracki, Antioch College, in WORK 425: Oral History & Digital Scholarship. Culture Change in Wazuka Japan (bilingual) 2016. A. Navarrette and M. Smith, Antioch College. Interviews With Color. 2016. I. Rosenthal, Antioch College, in WORK 425: Oral History & Digital Scholarship. Race/Object: The West Bank Wall in Israel/Palestine. 2016. A. Nace, Antioch College, in WORK 425: Oral History & Digital Scholarship. Unravelling Traditions of Mayan Textiles in Chiapas, Mexico. 2016. S. Edwards, Antioch College, in WORK 425: Oral History & Digital Scholarship. Experiences in Employee Ownership, Chroma Technology Corp. 2017.